When people say ‘solar energy,’ they immediately think of cutting costs on their monthly electric bills. This is understandably the primary reason why people consider getting themselves rooftop PV panels. However, deciding to convert to solar creates powerful impacts that extend far beyond one’s home! As soon as you install solar PV panels, you start saving money. Depending on where you live and your state’s laws, you can sell electricity to the grid and have zero bills! In addition, you don’t have to be reliant anymore on your electric company, which can raise prices whenever they want. You’ll also have immunity (to some degree) against blackouts! Going solar is probably the best home improvement project you can make, too. As sustainable energy proves to be more and more popular, having solar PV systems on your roof can even increase your property’s value, making it a sound investment! In fact, in a study by the Berkeley Laboratory recognized by the Department of Energy, it is claimed that a home with PV panels will sell $4/W or $15,000 for a 3.6-kW PV system, but it’s even higher in California, which remains the number one champion of solar energy in the US. Solar energy requires no combustion of fuels, unlike power plants that run on gas and fossil fuels. The reduction in carbon footprint is equal to avoiding climate change damages that could, by some estimates, reach amounts of up to $259 billion. That also means 17 million fewer metric tons of greenhouses gases. And while nuclear power plants need boiling water reactors to make electricity, solar panels don’t. That means saving enough water to supply 1.3 million homes. Isn’t it great that what you originally intended to benefit just your family can bring massive positive effects to the environment, too? The International Renewable Energy Agency (IRENA) reveals that as of 2016, the US solar industry supports 260,077 people, including installers, salesmen, laborers, and more. But more than the provision of livelihood, solar power protect lives. The reduction in toxic waste, especially greenhouse gas emissions, makes way for a healthier environment. With solar power, there are no pollutants going into the air, land, or water! This means a lowered risk for childhood asthma and other diseases. An estimated 25,000 to 59,000 premature deaths from 2015 to 2050 can be avoided. Furthermore, the national grid has varied sources of electricity when we introduce solar energy. This means that should one or two sources fail (e.g. power plants), a power outage won’t be possible on a national or massive scale. 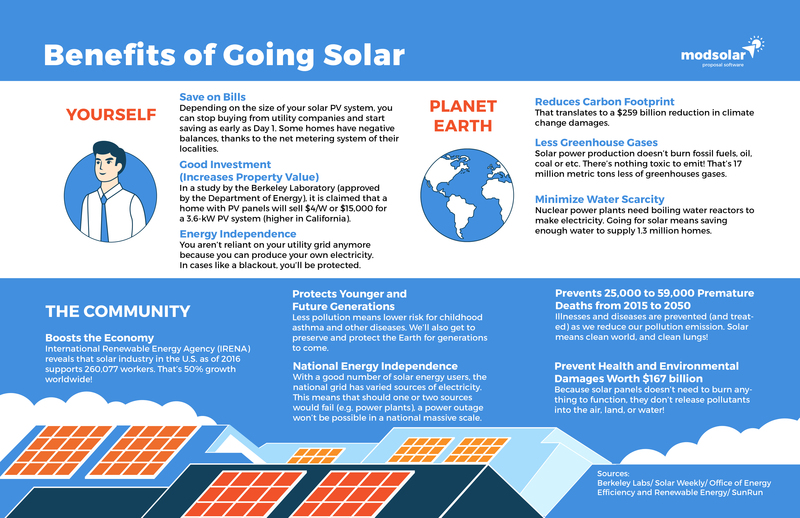 With solar PV systems, you’re saving money, the planet, and human lives! Though solar energy is currently expensive for the whole world to afford, with the cooperation of nations and technological experts, we may soon find a way to make the big shift within our reach. And with such beneficial effects to humanity and the Earth, we should strive to make it as soon as possible.